A series of extraordinary, one-off experiences created by Microsoft Surface, will be made available to intrepid Australians and New Zealanders who want to stand out from the crowd and have something truly unique to shout about. The ‘Anything But Ordinary’ series offers unexpected and spectacular locations with custom-built, inspiring activities that drive creativity, productivity and learning; complete with the latest Surface products to test in real-time. The locations selected are the result of scouring Australia and New Zealand for the most unexpected, exciting and spectacular destinations imaginable, providing the backdrop to intimately encounter new Microsoft devices, including Surface Pro 6 and Surface Laptop 2. In addition, the Surface GO will soon be available with 4G LTE connectivity to keep users online in more places whilst on the go, with all devices designed to stand out from the ordinary, and allow you to chase your ambitions through design, functionality and style. Those bold enough to do something different can apply through www.fb.com/SurfaceAustralia, with places available in a strictly limited supply from 20 November 2018. The first in the series features an idyllic cabin setting nestled on the hilltop of New Zealand’s dazzling Fox Glacier; the second, an opportunity to travel through the stunning and remote desert of Western Australia to peer into the aptly named Wolfe Creek Meteor Crater; and the final destination is a once-in-a-lifetime far-flung campout on the crystal white salt plains of Lake Gairdner in South Australia. Anything But Ordinary is open to everyone of good health and fitness, with all accommodation and transfer costs covered by Microsoft Australia. Spaces are extremely limited, so getting in early is strongly encouraged. Experiences commence from 30th November 2018, with spots available based on a creative entry submission of why entrants think they are anything but ordinary. Karen Paterson, Surface Category Lead, Microsoft, said: “Like the Surface products, we’ve designed the Anything But Ordinary Series to give guests an unexpected and stunning experience that stands out from the crowd. o An impenetrable frozen wonderland of blue ice-caves, steep vertical rock walls and dramatic overhangs is the first iteration of the Anything But Ordinary series. Leaving from Queenstown, guests will traverse through the dramatic countryside via helicopter, ice-climbing and snow trekking, venturing across the stunning ice with a journey as striking as the destination. A content-creators dream, at the apex, intrepid guests will find Chancellor Hut – a traditional alpine hut transformed into a tech hideout to kick back and review what they’ve captured, with a cooked dinner. o Experience sleeping on the edge of the unknown as we create a camping experience like no other. An epic, scenic journey across parts of Australia unseen by many, before reaching The Wolfe Creek Crater – one of the world’s most recognised meteor craters located in the remote Western Australian outback and only discovered from space in the late 1940s. Climb up onto the edge of the crater and peer into the unknown. If you dare. 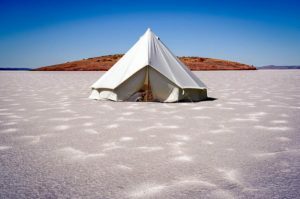 o Expansive white salt sheets juxtaposed against red sands and rocky outcrops, Lake Gairdner north of the Eyre Peninsula of South Australia is an Anything But Ordinary scene for a glamping stay. The isolated and open vistas will challenge guests and make for a journey like no-other. Bring your best Instagram game to capture the most jaw-dropping backdrops and enviable ‘staycation’ snaps. To pursue your difference and be in the running to experience a once in a lifetime journey, head to www.fb.com/SurfaceAustralia and tell us how you are Anything But Ordinary or join the conversation on Facebook, Twitter and Instagram, using the hashtag #AnythingButOrdinary. The newest additions to the Surface family – Surface Pro 6, and Surface Laptop 2, which are now both available in black – are available for purchase in Australia and New Zealand. Surface allows you to work and create freely, with powerful next-generation tech that gives consumers versatility, performance and design with every device. Every Surface is designed with these things in mind and every Surface is built to stand out from the ordinary.